By Jay Rogers. Posted October 17, 2017. 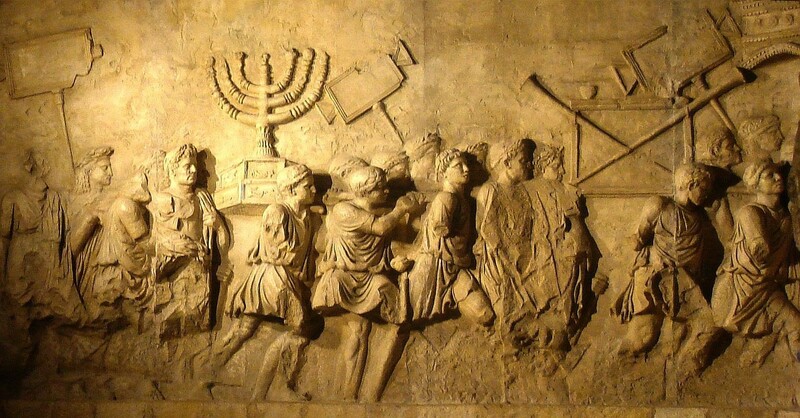 A contemporary Roman image of Revelation 19 in the Arch of Titus. Click to enlarge. The following is part 2 of an excerpt from my soon-to-be-published book, In the Days of These Kings: The Prophecy of Daniel in Preterist Perspective. In the book I discuss the prophecy of Zechariah as “bridge” material between Daniel and the New Testament. Zechariah 14:1-7 closely mirrors the language of Matthew 23:34-38 and Revelation 19:1-2,6-7,11,14; 21:9-10. Zechariah 14:1-7 seems to specifically refer to the Roman-Jewish War from AD 67 to 70. The preterist argument for Zechariah 14 and portions of Revelation 19 is that both were fulfilled in the destruction of the Temple in AD 70. Here we ought to let Scripture interpret Scripture. If Matthew 23:34-39 and Revelation 19:1-2,6-7,11,14 are about the siege of Jerusalem in 70 AD, then this portion of Zechariah is also about the same events. “Assuredly, I say to you, all these things will come upon this generation. O Jerusalem, Jerusalem, the one who kills the prophets and stones those who are sent to her! How often I wanted to gather your children together, as a hen gathers her chicks under her wings, but you were not willing! See! Your house is left to you desolate; for I say to you, you shall see Me no more till you say, ‘Blessed is He who comes in the name of the LORD!’” (Matthew 23:36-38, emphasis mine). Here Jesus is saying that the curse of blood-guiltiness due to the murders of God’s prophets, culminating in the martyrdom of Zechariah (which may or may not be the Zechariah of 520 BC – although it would be fitting here) would come on Jerusalem in “this generation,” that is, those alive in Jesus’ day would see it. Theodoret of Cyrus, writing in AD 460, believed that Zechariah 14:2 had an application to the Mount Olivet Discourse. “When you see Jerusalem surrounded by armies, know that its end is nigh; then let those in Judea flee to the mountains, and the one on the roof not go down to get something from the house” (Luke 21:22; Matthew 24:16,17). He forecast this also in blessed Zechariah, “that the remainder will not perish” (Zechariah 14:2). A likely historical fulfillment that can be drawn from Zechariah 14:3-7 and Matthew 24:15-22 is the Christians’ flight to Pella in AD 66. Christian historian Taylor Marshall explains. However, James was not wrong. Things were about to get bad in Jerusalem. Really bad. The Church historian Eusebius recounts that the Jerusalem Christians were warned in a vision to depart Jerusalem because its destruction was near. According to the Jewish historian Josephus, writing in about AD 75, “many of the most eminent of the Jews swam away from the city” in AD 64 (Jewish War II.20.1). In other words, this “exodus” from Jerusalem occurred three-and-a-half years before the destruction of Jerusalem in AD 70. “The whole body, however, of the Church at Jerusalem, having been commanded by a divine revelation, given to men of approved piety there before the war, removed from the city, and dwelt at a certain town beyond the Jordan, called Pella. Here those that believed in Christ, having removed from Jerusalem, as if holy men had entirely abandoned the royal city itself, and the whole land of Judea; the divine justice, for their crimes against Christ and his Apostles finally overtook them, totally destroying the whole generation of these evildoers form the earth” (Eusebius, Ecclesiastical History 3,5). And thus was fulfilled the words of Christ: “Truly, I say to you, this generation will not pass away till all these things take place” (Matthew 24:34) (Taylor Marshall, Eusebius on the Flight from Jerusalem in AD 64). I disagree with Taylor Marshall here only on the date of the Flight to Pella. AD 70 is not three-and-a-half years from AD 64. Instead, since the Roman armies did not appear until AD 66, the Flight to Pella most likely took place in the spring of AD 66 after the Jews had won a short-lived victory and had driven the Roman troops back to Caesarea. There the Roman general Cestius Gallus sent word to Nero of the defeat and promptly committed suicide. At this point, the early Christians fled the city, but the Jews rejoiced thinking God was favoring them in victory over the Romans. This peace lasted until the following year until the spring of AD 67, when Roman legions under Vespasian and Titus invaded Judea from the north and south. This campaign began in April of AD 67 and lasted another three-and-a-half years until the destruction of Jerusalem in September of AD 70. Despite Marshall’s mathematical slip-up, his eloquent and insightful analysis is correct. Likewise, Revelation 17,18 is about the destruction of the “Great City” – Jerusalem and the false system of Temple worship. In fact, the Temple furnishings are described so vividly in these passages that I find it amazing that so many have ignored this interpretation. The details of these chapters may be interpreted by Old Testament descriptions of the Temple. In Revelation 19, John prophesies about what will happen “after these things,” that is, after the destruction of the city of Jerusalem and the idolatrous system of Temple worship. After these things, I heard a loud voice of a great multitude in heaven, saying, “Alleluia! Salvation and glory and honor and power belong to the Lord our God! For true and righteous are His judgments, because He has judged the great harlot who corrupted the earth with her fornication; and He has avenged on her the blood of His servants shed by her.” … And I heard, as it were, the voice of a great multitude, as the sound on many waters and as the sound of mighty thunderings, saying “Alleluia! For the Lord God Omnipotent reigns! Let us be glad and rejoice and give Him glory, for the marriage of the Lamb has come and His wife has made herself ready” … Now I saw heaven opened, and behold, a white horse. And He who sat on him was Faithful and True, and in righteousness He judges and makes war … And the armies in heaven, clothed in fine linen, white and clean followed Him on white horses” (Revelation 19:1-2,6-7,11,14). In summary, we see a close parallel of Revelation 19 to Zechariah 14:1,2 – the destruction of physical Jerusalem. And we see a close parallel of Revelation 19 to Zechariah 14:3-7 – the armies of the Lord making spiritual warfare for spiritual Jerusalem. These passages can be seen as a more elaborate recapitulation of what is also described in Daniel 12:1-3.